The Daily Mail has published Ecuadorian surveillance photos of Julian Assange inside their embassy in London and claimed it is proof that the WikiLeaks founder was living in a “fetid lair.” The only problem is that the photos show a spotlessly clean bathroom and two dirty plates in the sink. 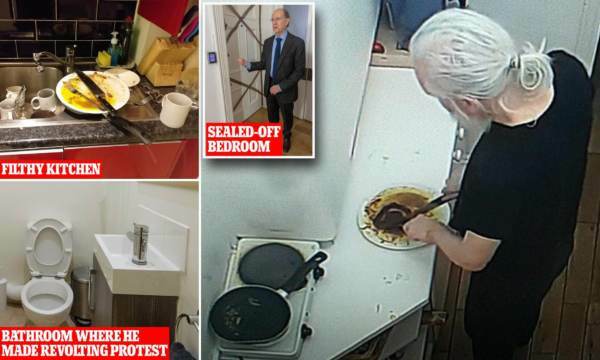 The photos also show Assange cooking a pizza on a clean counter — which the media is somehow using as “proof” that he is some kind of animal. The photos reveal a cleaner living situation than most of the journalists in DC — my home included. As someone who knows Assange, and has seen his personal hygiene on several occasions, this could not possibly seem more far-fetched. The Mail did not include any mention of Assange’s testimony from October, in which he called out the fact that he is being ruthlessly attacked in the media and cannot defend himself as Ecuador denigrates his character. This left him vulnerable to lies and campaigns to make him appear unsympathetic. Assange explained that it saddened him to “see information denigrating to my character not only spread by the various organisations that I have exposed, but, in this hearing, by some members of the Ecuadorian Government.” Assange said that the attempts to attack him personally are simply to “make headlines” and aid his persecution. You can read more about the Stasi-style surveillance at the embassy that made these photos possible in my article about our visit in January. More up-to-date background information about what is currently going on with WikiLeaks and Assange can be found here and here.